The earliest wood floors in North America were generally softwood, mostly Eastern white pine in the Northeast as well as local species such as cypress in the South. The wood came from virgin growth trees that were once abundant in large diameters, and though durable, they were easily worked into boards with simple hand woodworking tools. 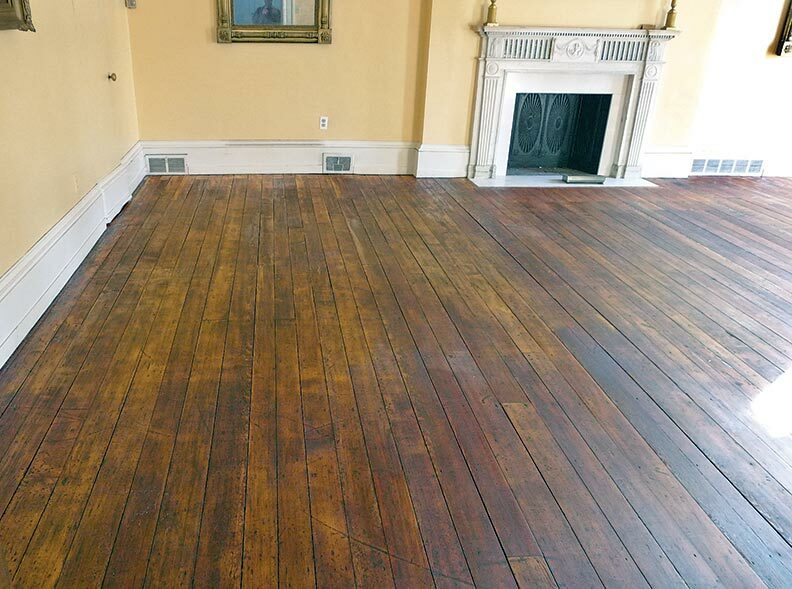 Wide-board softwood floors were typically painted or left bare, but by the mid-19th century, the picture was changing rapidly. Industrialization, and the mass production of wood products it made possible, dramatically altered the equation for wood flooring. Steam-powered woodworking tools greatly improved the volume and sophistication of wood flooring that could be produced, simplifying its installation with ready-formed narrow boards of tongue-and-groove flooring, thereby reducing its cost. This increased availability shifted the flooring market from softwood to hardwood, such as oak and maple, and with it came a new interest in finish. Hardwood presents another level of richness when coated with a thin, clear, flexible film that enhances the grain and adds an appealing glow. Though the vogue for clear floor finishes can be traced to parquet floors developed in 16th- and 17th-century France, the natural waxes and shellacs of that time were labor intensive to maintain, and not a viable option for Industrial Age American floors. Oil varnishes were the more durable alternative, and to give the coating glass-like depth and shine, two preparation steps borrowed from furniture making became essential. Wood grain patterns are most distinct under a clear finish when the wood surface is razor flat and literally slices across the cellular structure to bring the color gradations of the annual rings into focus. Though flooring fresh from a planing mill may be flat, it is not smooth enough to obtain this quality, so the important first step in floor finish preparation became scraping to remove mill marks. Working on hands and knees, carpenters or flooring mechanics would level out any high spots using hand planes and then go over every inch of the floor with scrapers. Related to planes, scrapers are ancient, simple finishing tools—in essence, pieces of steel with one edge burnished to produce a wire-thin cutting edge. 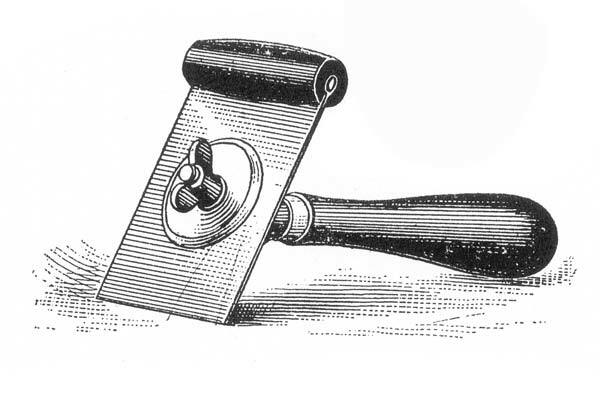 When drawn across the wood (or finish) at a slight angle, the scraper shaves off paper-thin curls of wood similar to shaving a beard, leaving a surface that is both smooth and remarkably even. Scraping produces high-quality results and is still better than sandpaper for removing mill marks, but it is a laborious process, requiring careful work and repeated sharpening of tools. Even by 1906, when the demand for finely finished floors was at a high-water mark, trade manuals noted that floor planing and scraping required a peculiar degree of skill and was the the hardest work about a building and no place for a man who is lazy or grouchy. To improve production and reduce the toil, tool manufacturers developed a variety of patented scrapers intended to hold the cutting edge at a consistent angle or with greater ease. At the height of scraping in the 1910s, just before the first electric sanders appeared, there were long-handled scrapers on the market with little wheels like a carpet sweeper that allowed the mechanic to stand upright while working. Except for its beauty, evidence of meticulous scraping may be hard to see today in an old floor, but filling can be easy to detect with close inspection. The natural cellular structure of most hardwood produces sawn boards with open grain, a surface covered with microscopic pores. Because these depressions are fairly large and conspicuous in some popular flooring wood, such as oak and ash, under a clear finish they leave a pitted or rippled surface that detracts from final gloss and clarity. The solution to this condition is filling, the process of building up the voids in the open grain and, in its way, is the opposite of scraping. Fillers of many kinds have been used for generations in the furniture trade, and those adapted for floor work sought the same attributes: transparency or at least a matching wood color (to allow the natural appearance of the wood to hold center stage), low cost, and ease of use. Wood fillers have been formulated by the end user for centuries, and by the 1890s the typical filler might be a finely ground, pigment-like material (such as wood dust, marble or quartz dust, or corn starch) mixed with a drying oil binder (typically linseed oil) and thinned with a solvent (turpentine). When mixed to a paste the consistency of mashed potatoes, the finisher would apply the filler over the floor with a rag, working against the grain of the wood to force it into holes and depressions. 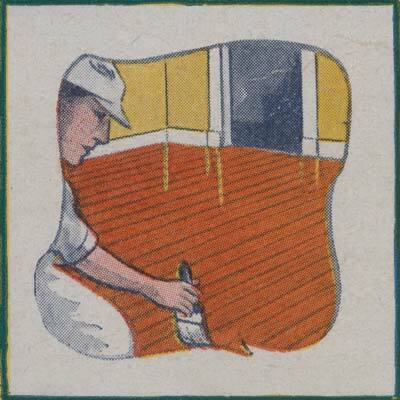 Once the filler had begun to dry, the finisher would wipe it from the floor using burlap or wood shavings, leaving the remainder below the surface in the wood pores. The result was a smooth, level surface ready for final finishing. 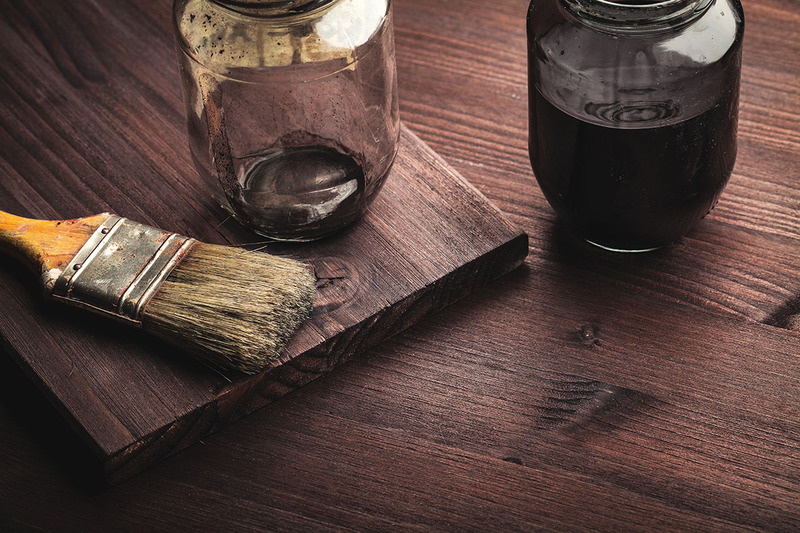 Though it&apos;s possible to clear-finish open-grain wood without a filler by repeatedly applying and rubbing out varnish until there is a level surface, applying filler as the first step is far more economical. Nonetheless, shellac was sometimes applied as a clear finish or filler and then scraped down to the wood surface so that only minute amounts were lodged in the pores. For old or new work, sand down to the finest grit practical in stages to remove mill marks, moving from, say, 80 grit to 220 grit. Vacuum meticulously between sandings, and don&apos;t make wide leaps between grits. Traditional wood fillers are still available for fine woodworking (albeit increasingly in altered, clean-air formulation) and can be an option for new open-grain wood floor installations. Test first to judge results. 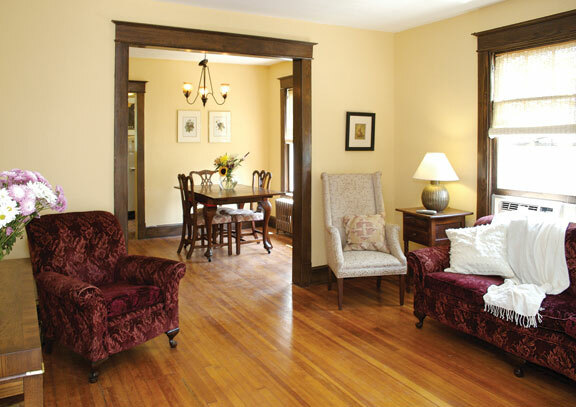 When refinishing floors, study the floor and existing finish first. Removing the old finish may remove old filler and varnish down to fresh wood, opening pores that will accept finish or stain unevenly. To avoid this possibility, consider applying a filler, or at least a stain controller, over the floor to even the absorption as well as level the surface. For shine or a deep appearance, apply at least three coats of finish, sanding lightly between coats. The first two only fill the wood surface, smoothing it for the final coat.